Many years ago, a good friend of mine got really sick and tired of the "corporate sellout" of what was on the radio in those days (disco, mainly), and found solace in the protest music of the 1960's. 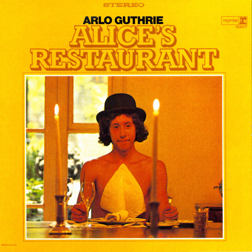 Finding teenaged hippies in the early 80's was interesting in and of itself, but what was impressive about Gord (my friend), was that he memorized, in its 25-minute entirety, "Alice's Restaurant Massacree", originally by Arlo Guthrie. Gord and I first met at a youth/young adults retreat at what would now be labelled a "liberal" Presbyterian church, which also included a lot of the burgeoning New Age emphasis of contacting the Divine resident in each of us, etc. Just a few months after I'd finished high school, I had moved back to the town I'd grown up in for college. While there, I had a lot of friends whom I was trying to share my faith with, and they would often say "hey, we are Christians -- we went on that retreat at the Presby. If you'd go, you'd understand." So, getting tired of this "talk to the hand" response, I went. And that's where I met Gord. We hit it off almost immediately, and hung out for most of the weekend. A lot of the teaching material seemed to be based on "if you have an emotional reaction to anything during this sleep-deprivation experiment, it's the Spirit of Christ that is in all of us", but since I already did have the Spirit of Jesus in me, I probably got more out of the retreat than most. At least, about six months later, fellow retreaters would ask me "how come we've lost the 'retreat feeling' and you haven't" -- can you say "open door" to sharing my story? Late Saturday night, Gord came over to my bunk and whispered "I can't sleep. You wanna go to the chapel and talk?" I had been thinking the very same thing, so Gord and I spent from about midnight until 7:30 AM in the chapel, burning candles, hunched over my tattered paperback Bible, and talking about God. Gord believed that Adam and Eve had been planted on earth by wise and benevolent aliens; he was really into reading peoples' "aura's", and commented that he knew I was a "Jesus Freak" when he first saw me: "All you Jesus Freaks have the same golden glow about you." We talked literally for hours about my own spiritual journey, his journey, and trying to figure out various Bible passages together. Long after the retreat, there would be "theology pub" nights -- except it was at Tim Hortons because (A) Starbucks didn't exist in Canada at the time, and (B) most of the group was too young to get into a pub -- where I would be one of two Christians present while many topics were discussed. One of my favourite Bible passages at that time was the Parable of the Sower, because that was where I was living on a regular basis. When I left for Bible college the following fall, Gord was one of the people who took up a collection among our friends, and bought me a leather-bound King James Bible as a going-away gift ("You seriously need a new Bible, dude..."), which they gave to me at the surprise going-away party that they threw for me. I learned a lot from Gord; we had great talks, and I learned very quickly that if I showed him the common decency and respect that friends share, he would listen to my story as well. I had "divine moments" of being able to share my faith with him, and learned an equally important lesson from the Parable of the Sower: we sow, but we are not the Seed. "During our work and other actions, even during our reading and writing on spiritual projects, more -- during our exterior devotions and vocal prayers -- let us stop a few minutes, as often as we can, to adore God in the depths of our hearts, to enjoy Him, as it were, in passing and in secret." There are times in this journey where I have Ecclesiastes Moments: "Meaningless! Meaningless! All is vanity and chasing after the wind!" I read anti-emerging blogs and feel (to use an vintage Vineyard phrase) "slimed" by the sarcastic and angry rhetoric. 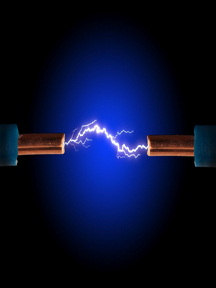 I surf over to pro-emerging blogs, and feel slimed by the sarcastic and angry rhetoric against the anti-emergents, the modern church, and western capitalistic society in general -- and it sometimes makes me want to unplug my own blog and withdraw from the conversation. Sometimes I pray, "Jesus, just give me a few friends who are people of the spark, and we'll do ministry together, in anonymity, and be satisfied with that and with You." The ranting and raving on all sides gets overwhelming at times. Not the kind of personal mission statement that I'd normally get excited about. That's when quotes like Brother Lawrence's and St. Bernard's come into play. They remind me that it's not about emerging, submerging, pomerging, or being post-evangelical, post-charismatic, post-colonial, post-post-modern, or whatever. And it's not about me. When I read about the great saints listed in the Hall of Faith (Hebrews 11) -- men and women of God who clung to their faith and their love of God, even though they died before seeing the results of their faith -- it helps to put things back into a proper perspective. Some people need to get back into the saddle again; perhaps I need to get back under it. Because it's not about me. The NIV version says to "take note" of others, while the NASB has the more passive "observe others", and the King Jimmy says we should "mark" others who are running the race well. It's hard sometimes to know what marks to take note of, observe, or keep track of. What outward signals do we notice that say to us, loud and clear, that we're in the presence of people who know Jesus pretty well, á la Acts 4:13? "When they saw the courage of Peter and John and realized that they were unschooled, ordinary men, they were astonished and they took note that these men had been with Jesus." We've all met people who almost immediately strike us as "wow, these people are close to God, and being with them brings me closer to God, and I feel encouraged and more faith-filled after spending time with them." Wendy and I have discussed this many times over the years; it just seems like some people have that "spark" within in them, and you can't help but notice it. Sometimes they're quite theologically astute, and sometimes not, but either way, you just knew that they "had been with Jesus" in a way that was encouraging, refreshing, and challenging all at the same time. A good friend of mine recently remarked in an email: "I will say openly that your orthodoxy is more generous than mine... I don't know if I should admire that or worry about you! You do seem to simply make the assumption that you'll settle into a local attractional / modern / organized / institutional / what-have-you kind of church congregation in Kelowna. Can I try not to be offensive and still ask why?" I guess the short answer is that I'll hang out in de-structured and structured places alike, if I encounter people there who have that "spark" of the Holy Spirit within them. I fully expect to meet some of them in a house church; I also expect to meet some really unhealthy people in a house church. I fully expect to meet "spark" people in the established church(es), and of course I am also painfully aware that I'll meet some really unhealthy people in these same churches. A few years ago, I re-read Keith Green's biography, No Compromise. One of the things that really gripped my heart at that time was the question: "Where are the passionate followers of Jesus now? I want to hang out with them again!" And, of course, we will also recognize that it is only as we pursue being people of the spark, that we will in turn be a blessing to others.